Is very bad to not read Jobu's Rum. That’s all it took to shatter the reputation and–in all likelihood–end the career of one of MMA’s all-time biggest stars. After months of speculation and anticipation, Ronda Rousey–the first ever female fighter signed to a UFC contract, whose dominance and charisma had popularized women’s MMA and generated some of the biggest buyrates in company history–returned to UFC following more than a year away from the octagon to challenge for the title she so dominantly held for three-and-a-half-years prior to her defeat at the hands of Holy Holm in late 2015. Her opponent, Amanda Nunes, had claimed that very same crown after destroying Miesha Tate back in July after Tate had rallied late to beat Holm for the crown several months earlier. Rousey was looking to take back what she felt was rightfully hers and Nunes was eager to prove herself more than a one-hit wonder while simultaneously ending the game of musical chairs the women’s bantamweight division has turned into over the past year. Going into the fight, admittedly, I had no idea what to expect. But that changed as I watched each fighter’s walk-in. I’m not one who normally takes much from watching fighters enter the cage or any type of pre-fight histrionics. It generally just comes off as theater to me and I don’t see much of a correlation between what occurs in the lead-up to the fight and the end result of the fight itself. This time was different, though. Thankfully for Ronda Rousey, Herb Dean was there, because if he hadn’t been, Nunes just may have proved my prophecy correct. The champ absolutely bludgeoned the returning star with brutal strikes until the aforementioned Herb Dean stepped in to stop the massacre in less than a minute. Rousey was still on her feet at the time of the stoppage, but clearly at major risk of being seriously and permanently hurt if the fight had been allowed to continue. Rousey, just as she had following her loss to Holy Holm a year earlier, left the cage without speaking to anybody and failed to show up to the post fight press conference. This was not a good look, especially considering how belligerent she had been with the media–even refusing to do virtually any press to promote the fight in the months leading up to it–because she felt they had helped to tear her down after Holm beat her. Rousey had also blamed the media and her focus on fight promotion for taking her eye off the ball and costing her the title. As a result, she vowed to spend the months before the Nunes fight doing nothing but training and getting into the best shape of her life so that she could return to her previous dominant form. 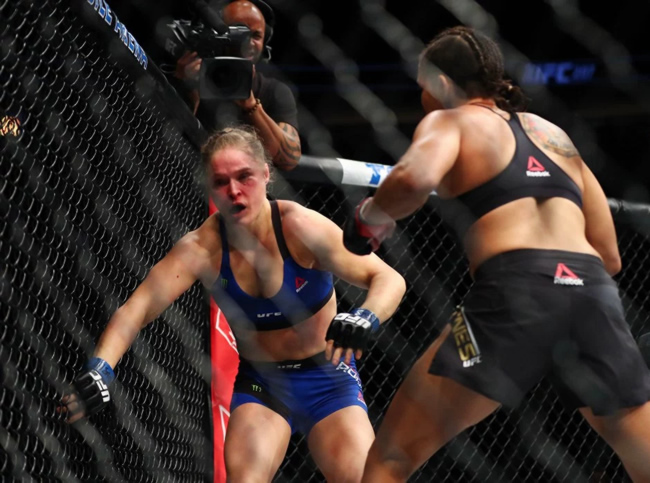 Unfortunately for Rousey, that strategy didn’t do her much good. There are a lot of reasons for Rousey’s defeat, first and foremost among them being her horrifically terrible strategy. Rousey and her trainer, Edmond Tarverdyan, seemed to think the proper game plan for beating Amanda Nunes was to walk through her strikes and grab her in an armbar. That is nice on paper, but in order for it to work, the person executing it has to be able to take the necessary punishment to get in position to implement it. That’s because no matter how many times we are publicly shown her punching mitts in the gym, Ronda Rousey’s standup is subpar. Anybody who has ever fought or even been in a boxing gym could see very quickly that she is slow, doesn’t move her head or tuck her chin, has sloppy form, and doesn’t react well at all to being hit. I know it is a moot point now, but these were all arguments I used to make while laughing at numbskulls who sincerely believed she could beat Floyd Mayweather in a fight. Ronda Rousey can’t beat Floyd Mayweather for the same reason she couldn’t beat Amanda Nunes: she simply isn’t quick enough, elusive enough, or tough enough to pay the price required to make a submission a realistic possibility (in Mayweather’s case, this is even more pronounced, as he is much faster, stronger, and hits boatloads harder than Amanda Nunes). Secondly, one could make the case that despite Nunes’ victory, Rousey had already lost this fight over a year ago when Holy Holm eviscerated and embarrassed her. This is not to take anything away from Nunes, who is a legitimate badass and would probably beat Rousey more often than not, even on Rousey’s best day. Still, though, it is hard to shake the feeling that Rousey’s confidence was shattered forever after what happened against Holm. Not only did she disappear in the wake of that loss, she even admitted strongly contemplating committing suicide. This is a woman who was clearly not equipped to handle losing and had her entire psyche and self-worth destroyed when she had her title taken in such humiliating fashion. Lastly, the question has to be asked: just how good was Ronda Rousey to begin with? Yes, she held the women’s bantamweight title for over three years and her lightning fast submissions were breathtaking to watch. But exactly who did she beat? With the exception of Sarah Kaufman–who has never been great at defending submissions–and Liz Carmouche–who is a B-level fighter–Rousey’s record is filled with opponents who are weak strikers, which plays heavily into her strength of grabbing and attempting submissions. That’s not to say Rousey was cherry picking fighters or that she was facing weak competition. However, it does highlight the fact that there simply haven’t been that many A-level female MMA fighters at 135 pounds. There are a lot of talented women at that weight class, but sometimes people forget just how new women’s MMA is to the mainstream. Sure, there have been plenty of women training and competing in MMA over the years, but until Rousey herself came along and made enough of an impression for the UFC to open its ranks to females and create the opportunity for them to fight professionally, what you mostly had was women who were trained in a single discipline (striking, wrestling, or submissions) and learned the rest as they went along. This is why for all the talk of her rise and fall baring strong resemblance to that of Mike Tyson, Rousey’s career path reminds me a lot more of a different combat sports legend. Back when it was an open-weight, one night only tournament format, Gracie went undefeated in the first four UFC events, racking up nearly a dozen submissions, while winning three tournaments, and only failing to win all four because an injury prevented him for continuing into the finals of UFC 3. The secret to Gracie’s success had been a wide-scale ignorance of Jiu-Jitsu, which left his opponents powerless to defend it, let alone counter it. He appeared one more time–an unbelievably boring draw with Ken Shamrock at UFC 5–before vanishing from the scene for five years. During that five-year period, more and more fighters learned how to protect against and execute submissions, and MMA evolved from a specialist freak show to a full-fledged sport with world class athletes who knew multiple disciplines, instead of just one. Gracie fought here and there in Japan–most notably in a marathon loss to Kazushi Sakuraba–but when he finally made his return to UFC in 2006, it did not go well. Admittedly, Gracie wasn’t in his prime at the time, but he got smashed by a different breed of fighter. Matt Hughes may not have been the world’s greatest striker or submission specialist, but he was very well-trained in how to defend against both of those disciplines, making it much harder than it had ever been for Gracie to pull off his hijinks. The man who seemed unbeatable in MMA’s infancy had been exposed as a one-trick pony, and the sport and its fighters had grown far too much at that point for that trick to work the same way anymore. Today, Royce Gracie is remembered as a pioneer and a legend, but it is widely recognized that he was, in many ways, a product of his time. Perhaps we will see Ronda Rousey the same way in five or ten years. For now, though, it seems fairly obvious that her career in the sport is over. We can sit and debate whether she was at one point overhyped or if she really was everything people thought she was. But much like Royce Gracie, who helped popularize a sport that was basically getting off the ground floor, Ronda Rousey was a trailblazer, to whom every single woman that ever has or ever will fight in MMA owes a debt of gratitude. Though maybe the next time Nunes sees Rousey, she can thank her in a more traditional manner–like buying her a drink–instead of rearranging her face. Theme Designed by Rohit Tripathi. © 2019 Jobu’s Rum. All Rights Reserved.